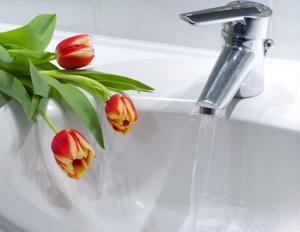 Bathroom decor never has to be boring - it can convey whatever aesthetic the homeowner decides. Anyone who doubts that statement should check out a penthouse bathroom recently reported on by the U.K. Daily Mail. Just walking in, users will see a modern bathroom vanity, red tile on the walls, and the toilet. It all seems quite normal. That is, until they happen to glance down. Hopefully, someone warns them in advance that this particular bathroom was installed over an abandoned elevator shaft. Because the floor just so happens to be made out of glass, making for a vertigo-inducing trip to the bathroom for anyone afraid of heights. "A characteristic feature of the project is that a volume that was originally intended for a second elevator, and was never installed, becomes a powder room with a glass floor that looks down all the 15 levels," said the architects, as quoted from the website ThisisColossal.com, according to the U.K. Mail. However, many people might be more interested in making their bathroom charming, rather than let guests briefly think they're about to fall to their doom. The I Heart Shabby Chic blog compiled a fairly extensive collection of cute bathroom pictures, that could provide ideas for anyone seeking to add some adorableness to what's certainly one of their favorite rooms in their house. The first picture has a rose-themed decor arrangement - with red and pink flowers used as patterns for the window curtains, a nearby bathrobe, floors and towels. For an addition of a little authenticity, a few actual flowers are on display on a nearby table. Live flowers actually show up quite often on the blogger's list of cute bathrooms, for reasons that don't take much mental fortitude to figure out. The image of flowers is often connected with romance, and what's cuter than romance? One of the source's most unusual picks is a bathroom with a purple decor theme. The standalone bathtub in the center of the room is purple and white, as are the towels and some of the flowers. It goes to show that sometimes, unconventional choices are the way to go when it comes to redesigning a bathroom. You would think that using as much purple as you could get away with would seem tacky, when in fact, this particular bathroom looks quite suave.